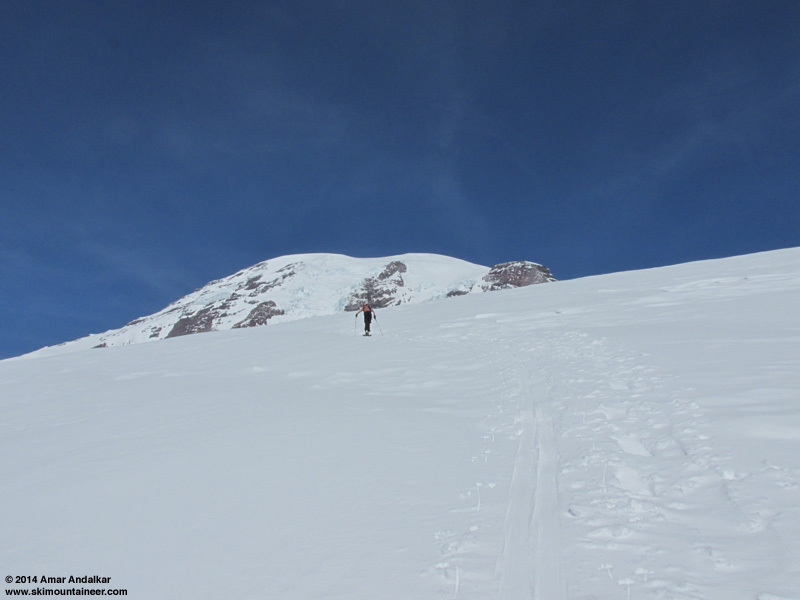 Skied from Camp Muir to Nisqually bridge during the nice weather window Monday, in decent but not great snow conditions overall. Actually the conditions were absolutely amazing compared to the previous Monday's nearly-unskiable breakable crust and ripping easterly pass-flow winds (see mini TR in storm cycle thread), but still not nearly as sweet as they were 4 weeks earlier the last time I skied to the bridge (March 11-12, Muir to Bridge Powder!). Deep snow at the Paradise parking lot. Snowdepth on this morning was 181" on the NWAC telemetry and 185" on the NPS snow stake, just a bit over 100% of normal. Partly cloudy skies in the morning gave way to full sun before noon. Headed up from Paradise just after 10am, with temps well above freezing and almost no wind. 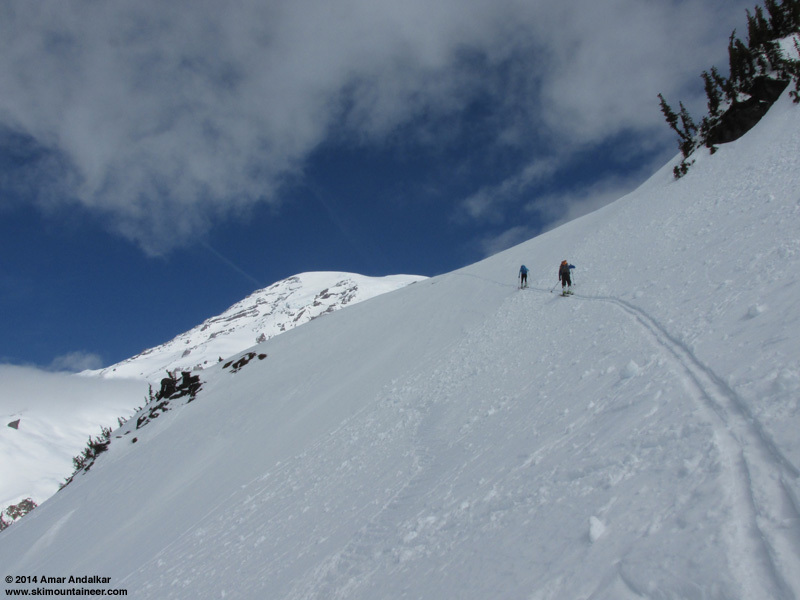 Ideal skinning conditions with several inches of grippy sun-softened snow atop a supportive crust, a very easy ski ascent of Pan Face without any sketchiness or need for ski crampons. 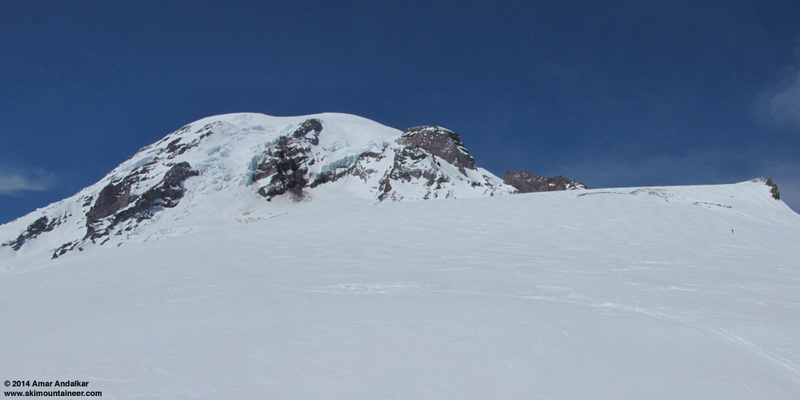 As forecast, a SW wind gusting to 20-30 mph kept things cool above 8000 ft, and we cruised into Camp Muir around 1pm, happy to get out of the wind in the public shelter along with a few other regular skiers whom I'd met in the parking lot. The others were going to head for the Cowlitz side, but I decided to stick with my original plan and ski to the bridge. Decent windpacked powder up high, as long as one followed the ribbons of nice snow and avoided the areas of sastrugi. The best turns were from about 9000-7500 ft, smooth sun-softened proto-corn. 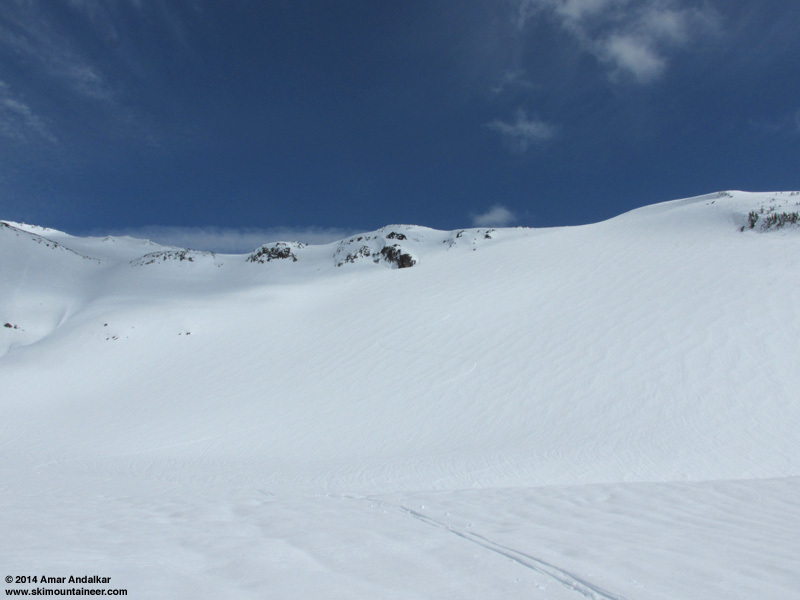 Two-shot panorama of faint ski tracks on the Muir Snowfield. 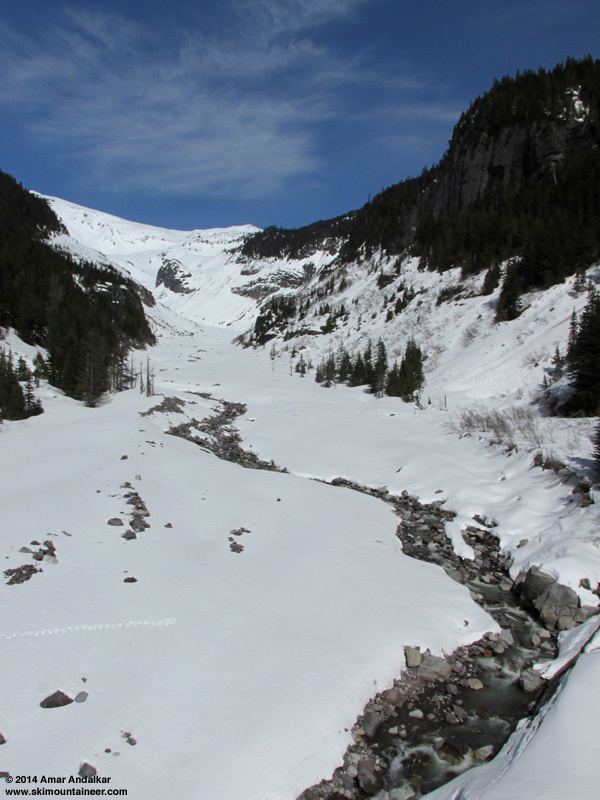 I traversed over and took a look down the entrance of Nisqually Chute, but was never really planning to go that way given the unknown and probably significant avalanche hazard on this steep south-facing slope. The snow got wetter below 7500 ft, definitely no powder this time even on NW aspects as diffuse solar radiation during the clouds on Sunday and the higher springtime solar angle had done its work. But thankfully not sticky to ski, no sudden fast-slow variations and no breakable crust at all. Skied the much safer NW aspect near Pebble Creek that I had on March 12 instead. There were no other tracks at all in the entire Nisqually basin, and the last track I crossed was near Pebble Creek just before I dropped down that face. 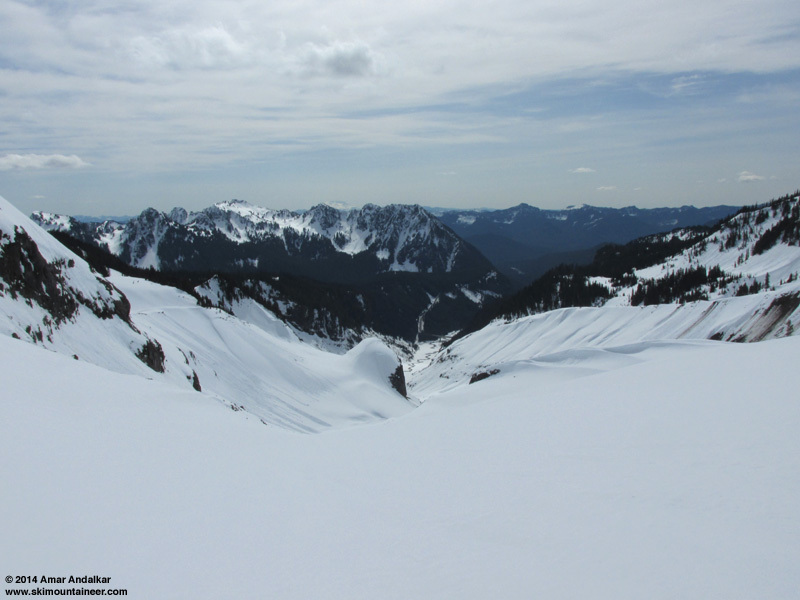 Faint ski track on the face down to Nisqually Glacier. Evidence of the huge early March avalanche which ran from somewhere above 10000 ft all the way down to 4900 ft, with a path length of about 3 miles, has almost entirely vanished since I was last here on March 12 (see photos and map in that TR). Which was to be expected given that about 8 ft of new snow has fallen at Paradise over those 4 weeks (and over 10 ft higher up). A few traces of the avalanche track and deposit are still visible in spots, but only if you know what you're looking for. The snow got a bit stickier on the flats of the Nisqually Glacier below 6300 ft, and I tried a quick application of Swix F4 paste wax on my otherwise nearly wax-free Dynafit Cho Oyus. The wax may have helped a bit, but it was still slow going. Not bad though, since there was no bottomless mush or deep trenching, just several inches of sticky saturated semi-consolidated snow that needed a couple more days of sun to be good. 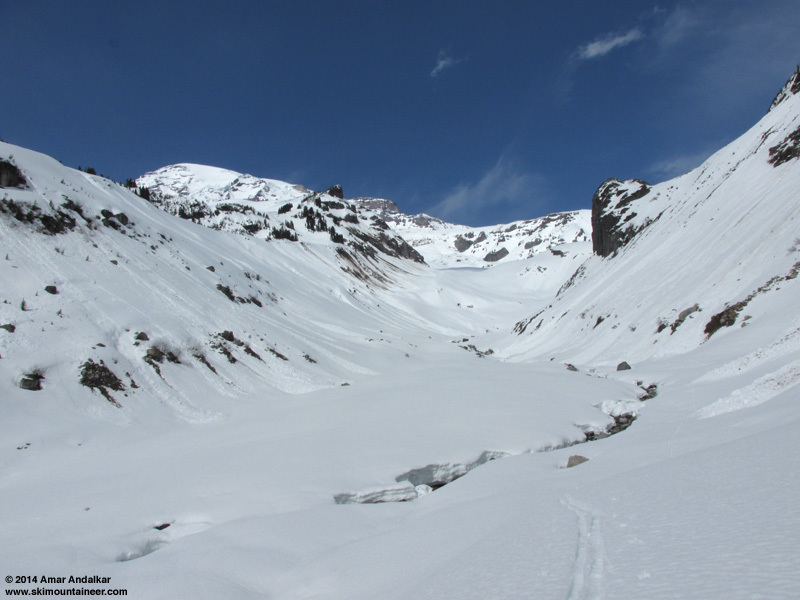 The ski out to the bridge was still in excellent shape, although dozens of moderately-large avalanches had run down the slopes on either side just below the glacier terminus. All appeared to be at least a day old and it never felt like anything was likely to slide down from above, nothing was moving as I skied past and even across a couple of debris toes near the river. There is still about 3-4 ft of snow at the bridge (3900 ft), so the ski out should remain good for a couple weeks at least, even without additional snowfall. The skier's left side remains far better, as the right side has an unavoidable section of almost-bare steep eroding slope to traverse just before getting near the bridge. The exit ramp through the slide alder remains very easy to navigate with no bushwhacking, and the sticky grippy snow avoided the need for skins. Out to the road just after 3pm, and managed to hitch a ride with a friendly pickup truck driver within 15-20 minutes, thanks Tom! Another outstanding day at the office with 6200 vert of almost completely untracked turns, despite the snow conditions being less than excellent. 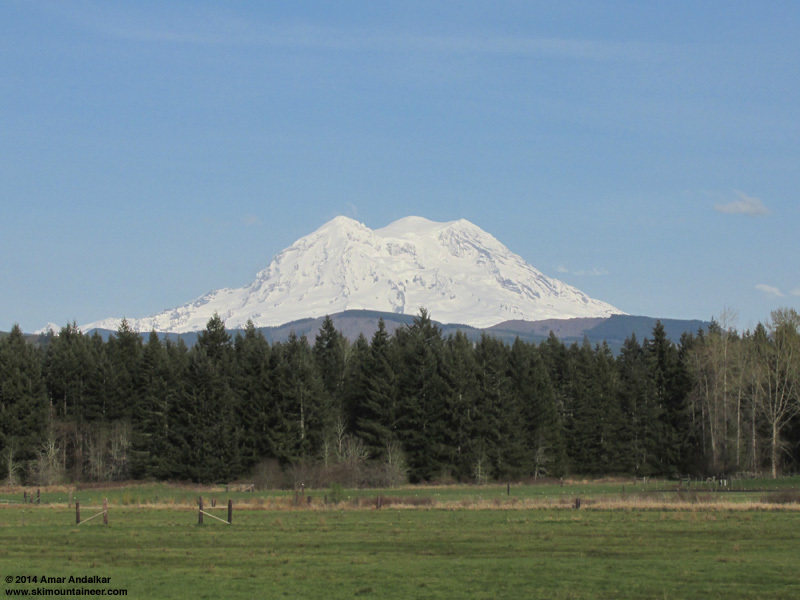 The drive home really felt like springtime (even summertime), with temps over 70 �F for most of the way back to Seattle. A few more days of sun would improve snow conditions substantially, although several inches of new snow are falling above 7000 ft as I write this on Tuesday evening now. Thankfully the sun is forecast to return for much of the next 5-6 days though. Might be the right setup for a pretty good early-spring corn cycle. 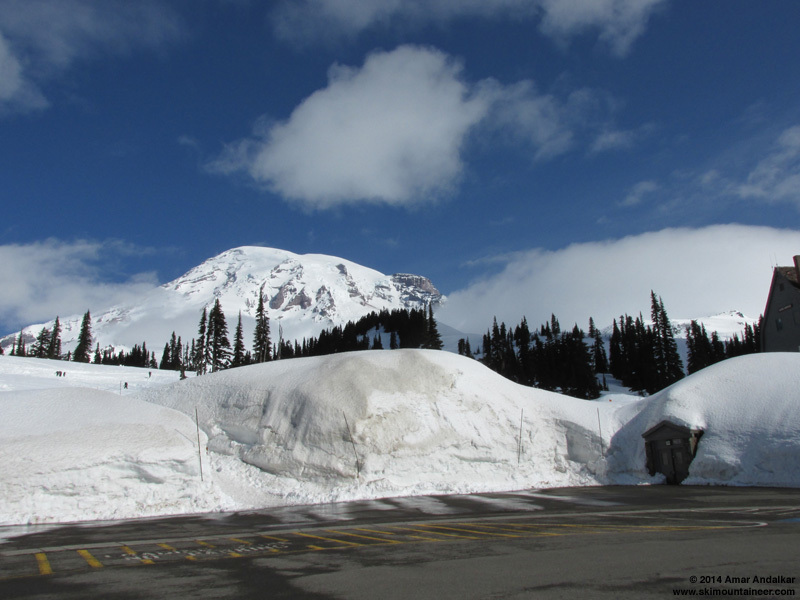 SYNOPSIS...AN UPPER RIDGE WILL MOVE ACROSS WESTERN WASHINGTON MONDAY FOR MAINLY DRY AND WARMER WEATHER AT MOUNT RAINIER NATIONAL PARK. A COLD FRONT WILL BRING ANOTHER ROUND OF PRECIPITATION TUESDAY AFTERNOON AND NIGHT. THE SNOW LEVEL WILL BE AROUND 7000 FEET WHEN MOST OF THE PRECIPITATION OCCURS...THEN FALL TO AROUND 4000 FEET TUESDAY NIGHT. DRIER WESTERLY FLOW ALOFT WILL PREVAIL WEDNESDAY AND THURSDAY. AN UPPER TROUGH WILL MOVE THROUGH FRIDAY FOR A CHANCE OF LIGHT PRECIPITATION. ANOTHER UPPER RIDGE SHOULD RESULT IN PARTLY TO MOSTLY SUNNY DAYS THIS WEEKEND. MONDAY...MOSTLY SUNNY. FREEZING LEVEL NEAR 8500 FEET. MONDAY NIGHT...PARTLY CLOUDY. FREEZING LEVEL NEAR 9500 FEET. TUESDAY...PARTLY SUNNY IN THE MORNING...THEN RAIN AND SNOW LIKELY IN THE AFTERNOON. SNOW LEVEL NEAR 7500 FEET. TUESDAY NIGHT...BREEZY. RAIN AND SNOW IN THE EVENING...THEN RAIN AND SNOW LIKELY AFTER MIDNIGHT. MODERATE SNOW ACCUMULATIONS. SNOW LEVEL NEAR 7000 FEET DECREASING TO 4000 FEET AFTER MIDNIGHT. WEDNESDAY...MOSTLY SUNNY. FREEZING LEVEL NEAR 5000 FEET. WEDNESDAY NIGHT...PARTLY CLOUDY. FREEZING LEVEL NEAR 5000 FEET. THURSDAY...MOSTLY SUNNY. FREEZING LEVEL NEAR 5000 FEET. THURSDAY NIGHT...MOSTLY CLOUDY. FREEZING LEVEL NEAR 6500 FEET. FRIDAY...MOSTLY CLOUDY WITH A CHANCE OF RAIN AND SNOW. SNOW LEVEL NEAR 5500 FEET. FRIDAY NIGHT...MOSTLY CLOUDY WITH A CHANCE OF RAIN AND SNOW SHOWERS. SNOW LEVEL NEAR 6500 FEET. SATURDAY...PARTLY SUNNY. FREEZING LEVEL NEAR 6500 FEET. SATURDAY NIGHT...PARTLY CLOUDY. FREEZING LEVEL NEAR 8000 FEET. SUNDAY...PARTLY SUNNY. FREEZING LEVEL NEAR 8000 FEET. As usual a great report. I think the powder season is over. Time for corn harvesting once it tassles. Nice report. See any loose wet slides? I was considering heading up solo Monday but the forecast turned me back (still not quite confident enough yet solo). Nice, and good news. I was planning on getting down there next weekend, Saturday or Sunday. Hope the weather holds out.